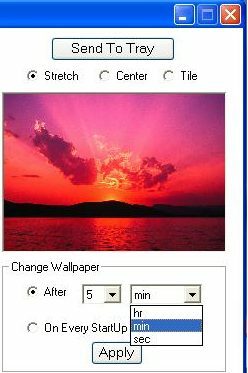 ScrollWall is a free wallpaper changer that can automatically change wallpaper whenever your PC starts, or you can choose to change wallpapers after scheduled time. You can specify the set of wallpapers from your computer, and ScrollWall will choose from them automatically. ScrollWall is a really simple to use wallpaper changer. You start by selecting wallpapers from your computer. You can select as many wallpapers as you want. Then, you can choose whether you want to display wallpaper in Center mode, stretch mode, or Tile Mode. Then you select when you want to change the wallpaper. You can choose to either change wallpaper On every startup of PC, or you can specify time in seconds/minutes/hours after which you want to change the wallpaper. Unlike John’s Background Switcher and Webshots Desktop, ScrollWall allows you to select wallpapers from your local computer only. If you do not have lot of images on your PC that you can use as wallpaper, you can use free image search engine to find some more images. ScrollWall scores really high in terms of ease of use. It is very intuitive, and anyone can use it with ease. This free wallpaper changer comes from the same developer who made SpeedDefrag, and MP3Knife.